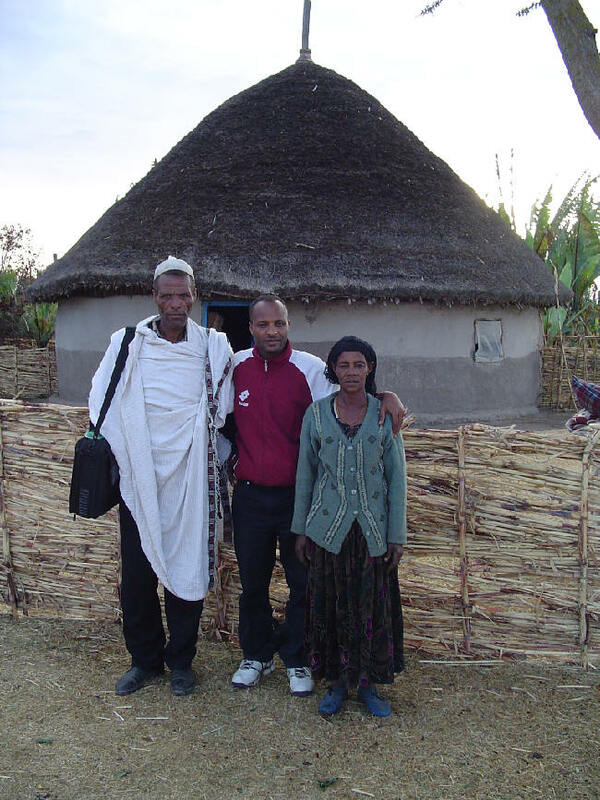 At the end of our time in Ethiopia, we were given a very special honor and privilege: a visit to the home of our son David Halango. “David” is not his birth name. Not until we arrived in Ethiopia did he take the Christian name David. He had asked the Lord for 12 years to give him Christian parents, and in the perfect timing of our Lord we were sent to him. He was born into a Muslim family and was given the name “Ahmed.” As the oldest son in his family, he was given every privilege possible. His father Halango is truly a great man, a strong leader in the community of Deda. When David entered secondary school, he was sent to live with an uncle in Alaba Town. A friend at school introduced him to Christ. Unlike most strong Muslim parents, Halango did not throw Ahmed out of the family. His love for his son has continued strong, and it is this love that has moved him to openness to the Gospel. Today, Halango is no longer actively persecuting those coming to Christ in the Deda village, but he also has not embraced the Lord Jesus for himself. Last summer he came to a showing of the Jesus Film. Over 400 people watched the movie on a little 15-inch laptop! And 38 of these people made decisions for Christ. Although he himself didn’t decide for Christ, he said he was open to listening to Christian music. So I took him a small cassette recorder, some rechargeable batteries, a recharger, and a voltage/plug adapter. He can go into town to recharge the batteries at the Alaba town church. During our short visit to their home, we basked in the hospitality of Halango and his wife Achame. It was an honor to be included in their family, to eat at their table, and to sleep in their home. David's brother walked 12 hours to be with us in their home! 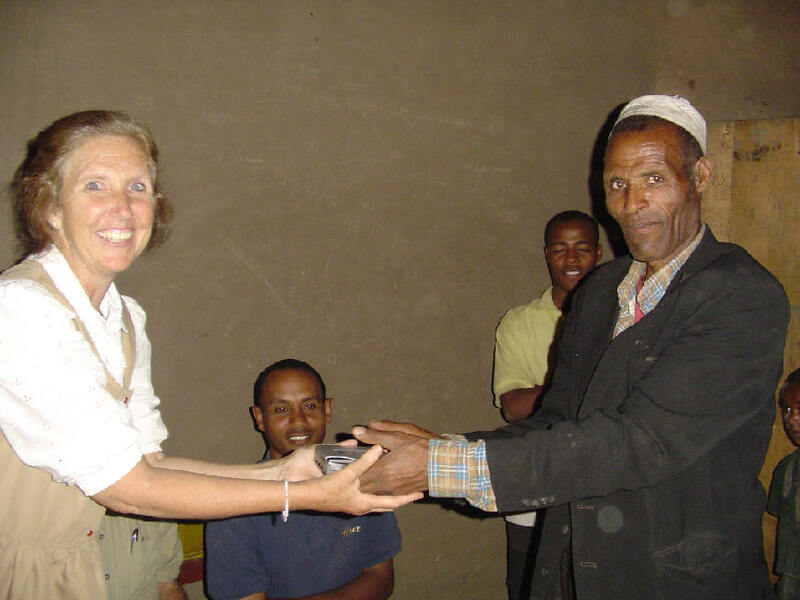 At the end of our visit, as we were leaving, Halango reached for my hand, and I savored the moment – a strong Muslim man holding the hand of a white Christian woman from America; he was making a statement to all in the community that the Christians were to be respected and appreciated. (Remember, it wasn’t that long ago that it was unsafe for a white foreigner to travel in this section of Ethiopia, so strong was their hatred because of the Iraq situation!) Halango is not far from salvation. And he has such strong influence in the community, when he comes through the door many will follow him. Please, please, please pray for his heart to be opened to the Gospel. It is Christ’s love in David and others that is drawing this man. There is no replacement for love. Fifteen years ago, when David came to Christ, there were two other boys from this village who also came to Christ. This was the birthing of the Lord’s church in Deda. It grew slowly. First a hut was built; churches in Muslim areas need quiet beginnings, so a simple hut that looks like a home attracts less attention. But as the congregation grew strong in number and in Christ, a church building was needed. So two years ago, a simple rectangular building was erected. It has mud-&-stick walls, wood shutters and doors, a tin roof, and a few crude benches. Since the building was erected, the congregation has exploded. As I’ve already mentioned, 38 came to Christ last August after the showing of the Jesus Film on a laptop. In fact, in the 4-month period prior to our visit, no less than 198 (!) new believers have come to this church. (And while we were there another 15 came to Him.) Imagine growing from a congregation of 100 to 300 in only 4 months! And most of the new believers are young people in the 20-30 year age range. I tell you, if this doesn’t get you excited, you must be dead! As Dave and I met with the “elders” (themselves young men), we were impressed with men who are young in the faith but are eager to grow in our Lord Jesus. They are so “green” in spiritual issues, it was downright refreshing. Their’s is a simple faith, uncomplicated by religious tradition or church polity. Jesus is Lord – this is the simple truth they know and live by. We asked the leaders, “How can we help you?” They asked for 3 things, and we offered a fourth. What were they? (1) A guitar, with which to draw people to the church services; no one has any musical instruments (except the traditional drum), so people come just to see the guitar being played. (2) Benches to sit on, so they don’t have to gather leaves every Sunday to cover the dirt floor; greenery is scarce. 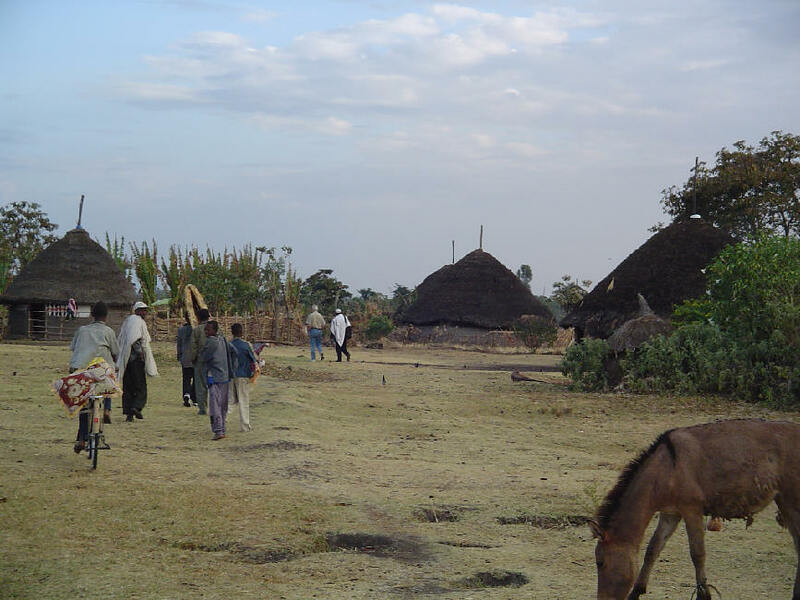 (3) A perimeter foundation of stones and concrete to keep the termites from eating their building; termites are an extreme problem in much of Ethiopia. (4) Bibles; they have only 20 Bibles in a congregation of 300! We have always taken unallocated money with us on our trips, ready to minister to those the Lord puts in our path. 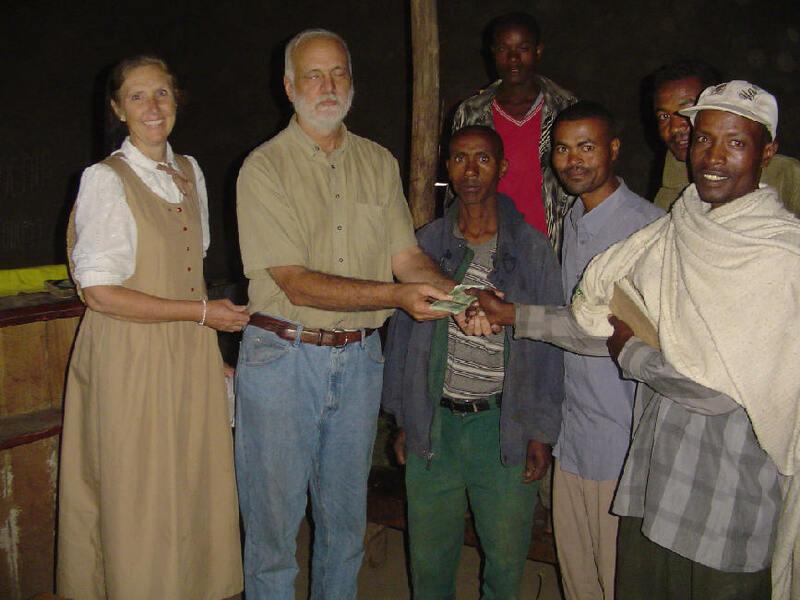 On this trip, we had provided funds for two blind boys in Burji, so they could go to Addis for examination. And we had given funds for medical treatment to several impoverished believers in Alaba. But the Lord hadn’t directed us much with regards to the use of this money. When we met with the Deda church, we understood why our Lord had arranged things as He had. We had on our persons the funds for the benches and the guitar. And we made an agreement with the Deda leaders: if two-thirds of the congregation would memorize the nine passages of Scripture for the Bible memory program, we would, by God's grace, fund the concrete perimeter and give a Bible to anyone who had completed the program. I wish you could have seen their faces when we told them! Words simply cannot express their excitement. “We will do it!” they exclaimed with joy. In addition, we encouraged them to assume responsibility for the teaching of their little flock, so we gave them some basic books on understanding the Scriptures. The “life story” of this little congregation in the Deda village is typical of many villages in Alaba. Our Lord is ready to save; He is willing to save; He is able to save. And He is preparing to do a great work in the Alaba area of Ethiopia. The only question is: are we ready to work in the harvest?